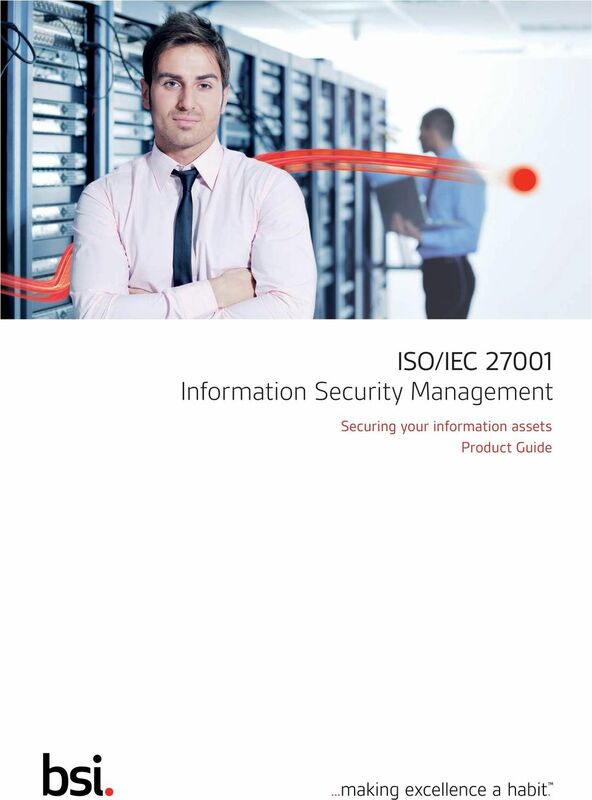 Download "ISO/IEC 27001 Information Security Management. 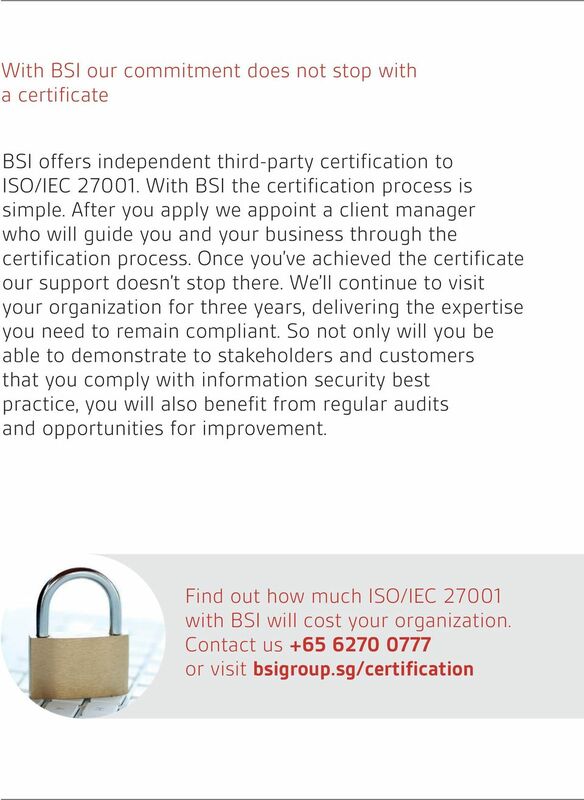 Securing your information assets Product Guide"
4 The benefits of ISO/IEC ISO/IEC brings many benefits, especially when combined with independent certification from BSI. 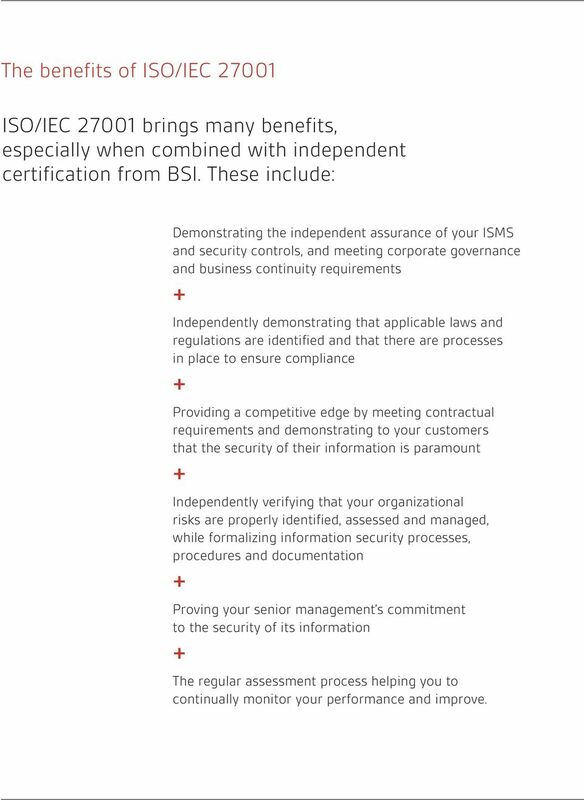 These include: Demonstrating the independent assurance of your ISMS and security controls, and meeting corporate governance and business continuity requirements + Independently demonstrating that applicable laws and regulations are identified and that there are processes in place to ensure compliance + Providing a competitive edge by meeting contractual requirements and demonstrating to your customers that the security of their information is paramount + Independently verifying that your organizational risks are properly identified, assessed and managed, while formalizing information security processes, procedures and documentation + Proving your senior management s commitment to the security of its information + The regular assessment process helping you to continually monitor your performance and improve. 5 CURRENT SITUATION CONTINUAL IMPROVEMENT MANAGEMENT REVIEW ISMS POLICY CHECKING & CORRECTIVE ACTION PLANNING IMPLEMENTATION & OPERATION ISO/IEC Model Before you can implement an Information Security Management System (ISMS), you must understand what information you currently have and how it is used by your business. Your current activities, products and services all impact on information security. 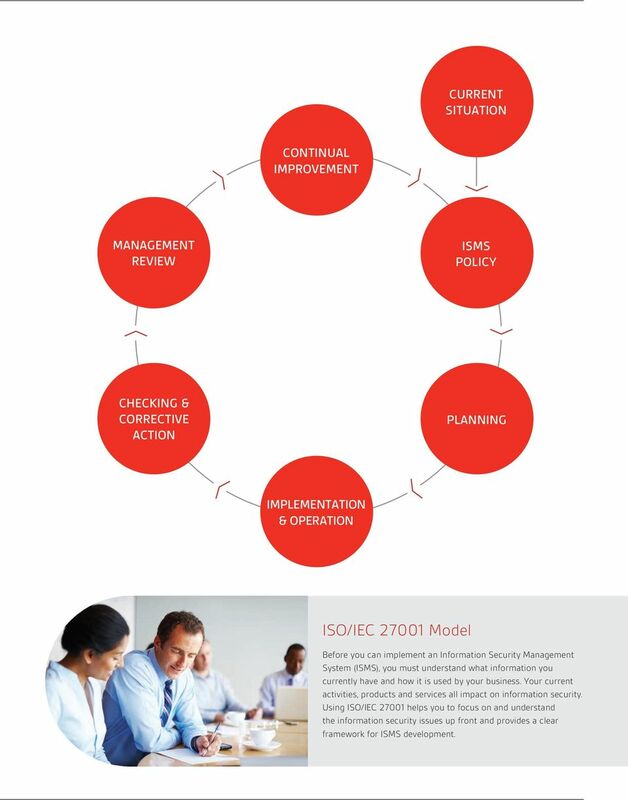 Using ISO/IEC helps you to focus on and understand the information security issues up front and provides a clear framework for ISMS development. 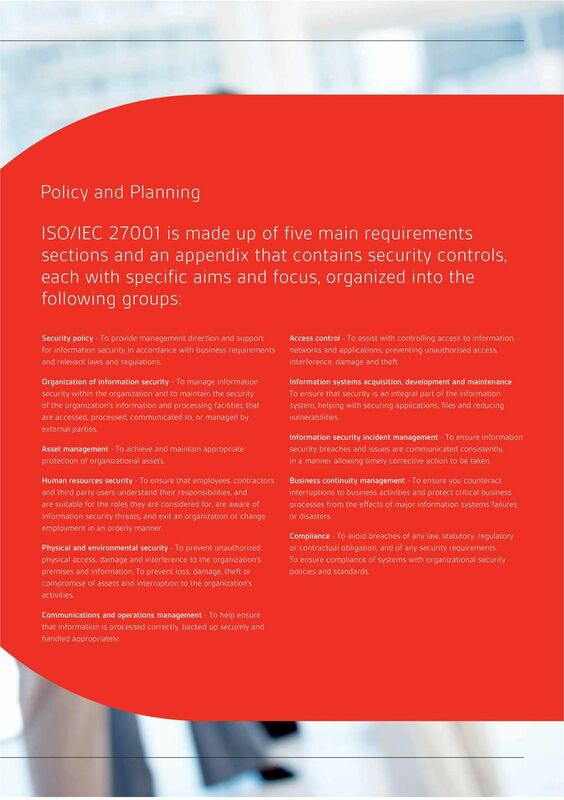 7 Policy and Planning ISO/IEC is made up of five main requirements sections and an appendix that contains security controls, each with specific aims and focus, organized into the following groups: Security policy - To provide management direction and support for information security in accordance with business requirements and relevant laws and regulations. Organization of information security - To manage information security within the organization and to maintain the security of the organization s information and processing facilities that are accessed, processed, communicated to, or managed by external parties. Asset management - To achieve and maintain appropriate protection of organizational assets. Human resources security - To ensure that employees, contractors and third party users understand their responsibilities, and are suitable for the roles they are considered for, are aware of information security threats, and exit an organization or change employment in an orderly manner. Physical and environmental security - To prevent unauthorized physical access, damage and interference to the organization s premises and information. To prevent loss, damage, theft or compromise of assets and interruption to the organization s activities. Access control - To assist with controlling access to information, networks and applications, preventing unauthorised access, interference, damage and theft. Information systems acquisition, development and maintenance To ensure that security is an integral part of the information system, helping with securing applications, files and reducing vulnerabilities. Information security incident management - To ensure information security breaches and issues are communicated consistently, in a manner allowing timely corrective action to be taken. Business continuity management - To ensure you counteract interruptions to business activities and protect critical business processes from the effects of major information systems failures or disasters. Compliance - To avoid breaches of any law, statutory, regulatory or contractual obligation, and of any security requirements. To ensure compliance of systems with organizational security policies and standards. Communications and operations management - To help ensure that information is processed correctly, backed up securely and handled appropriately. 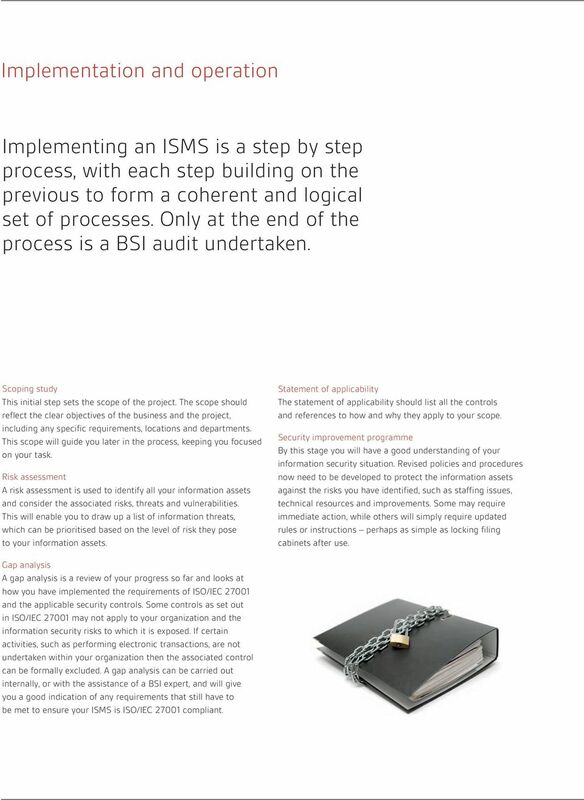 8 Implementation and operation Implementing an ISMS is a step by step process, with each step building on the previous to form a coherent and logical set of processes. 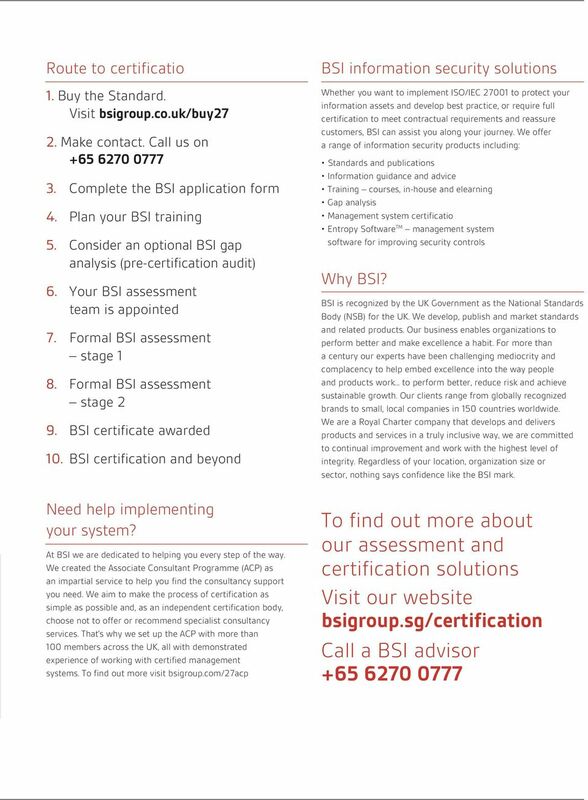 Only at the end of the process is a BSI audit undertaken. Scoping study This initial step sets the scope of the project. The scope should reflect the clear objectives of the business and the project, including any specific requirements, locations and departments. This scope will guide you later in the process, keeping you focused on your task. Risk assessment A risk assessment is used to identify all your information assets and consider the associated risks, threats and vulnerabilities. This will enable you to draw up a list of information threats, which can be prioritised based on the level of risk they pose to your information assets. Statement of applicability The statement of applicability should list all the controls and references to how and why they apply to your scope. Security improvement programme By this stage you will have a good understanding of your information security situation. Revised policies and procedures now need to be developed to protect the information assets against the risks you have identified, such as staffing issues, technical resources and improvements. Some may require immediate action, while others will simply require updated rules or instructions perhaps as simple as locking filing cabinets after use. Gap analysis A gap analysis is a review of your progress so far and looks at how you have implemented the requirements of ISO/IEC and the applicable security controls. Some controls as set out in ISO/IEC may not apply to your organization and the information security risks to which it is exposed. If certain activities, such as performing electronic transactions, are not undertaken within your organization then the associated control can be formally excluded. A gap analysis can be carried out internally, or with the assistance of a BSI expert, and will give you a good indication of any requirements that still have to be met to ensure your ISMS is ISO/IEC compliant. 12 BSI Group Singapore 1 Robinson Road #15-01 AIA Tower Singapore T: E: W: bsigroup.sg The trademarks in this material (for example the BSI logo or the word KITEMARK ) are registered and unregistered trademarks owned by The British Standards Institution in UK and certain other countries throughout the world. Need to protect your information? 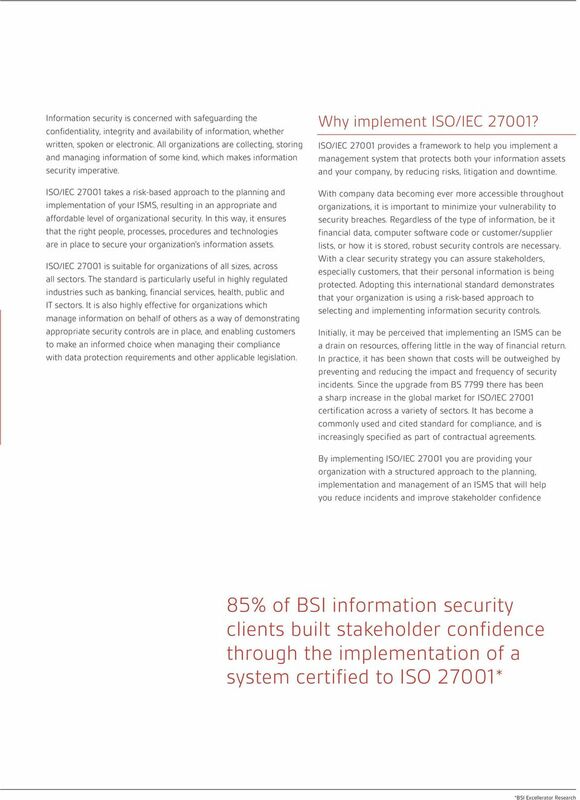 Take action with BSI s ISO/IEC 27001. Need to protect your business from potential disruption? 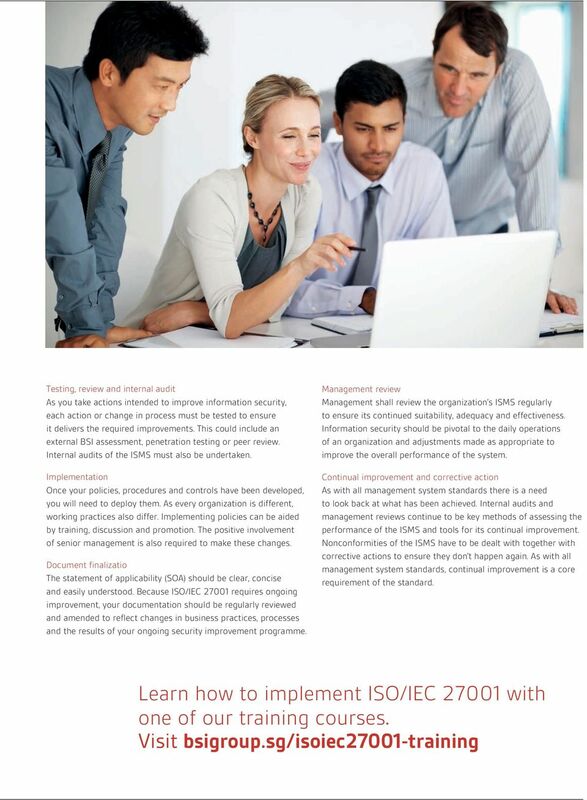 Prepare for the unexpected with ISO 22301. Need a system to deliver consistent, efficient and reliable IT services? 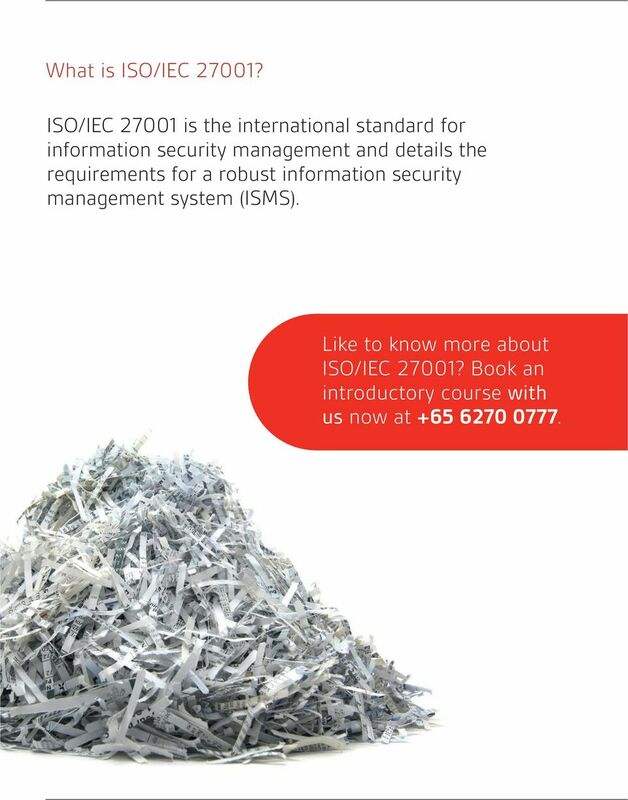 Use an ISO/IEC 20000 compliant management system. Need to optimize your assets? Be proactive with ISO 55001. Standards and accreditation Tools for delivering better regulation Introduction Standards and accreditation are marketbased tools that can be used by Government policy makers to deliver better regulation. Health and safety a priority? Our BS OHSAS 18001 should come first. La Trobe University is committed to maintaining a comprehensive and effective Compliance Framework.